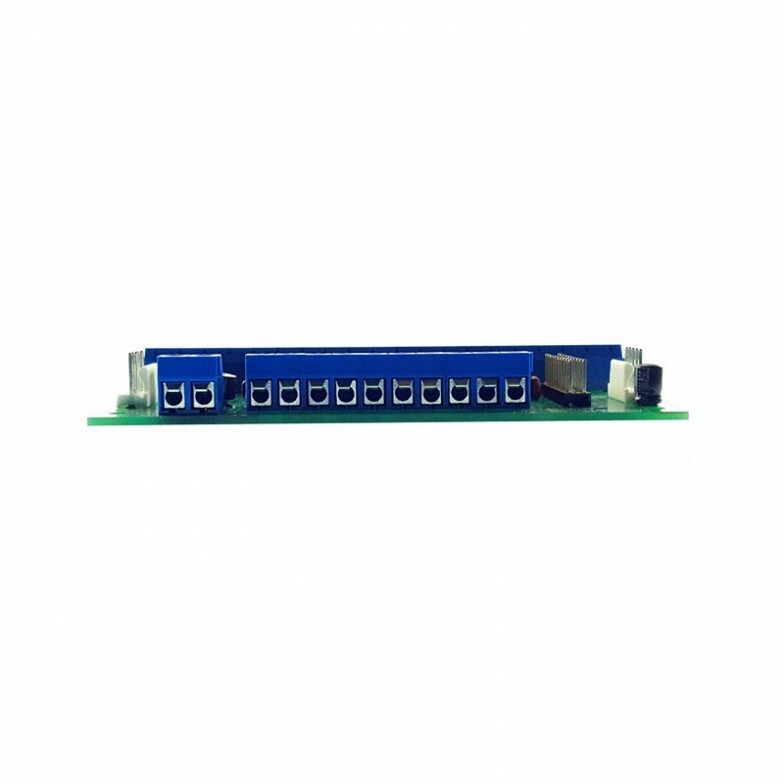 Each Rotary-5 has five independent quadrature signal rotary encoder switch inputs. Mechanical and/or optical rotary encoder switches may be used. Multiple Rotary-5 units may be daisy chained together to expand the number of rotary encoder switches. Two outputs which activate independently based on rotary switch direction. Outputs pulse low for 50msec for each switch direction and position. Jumper option allows the number of outgoing pulses (per each incoming pulse) of the rotary switch to be divided by either 2 or 4. Input activation overflow may be buffered or ignored based on a jumper setting. 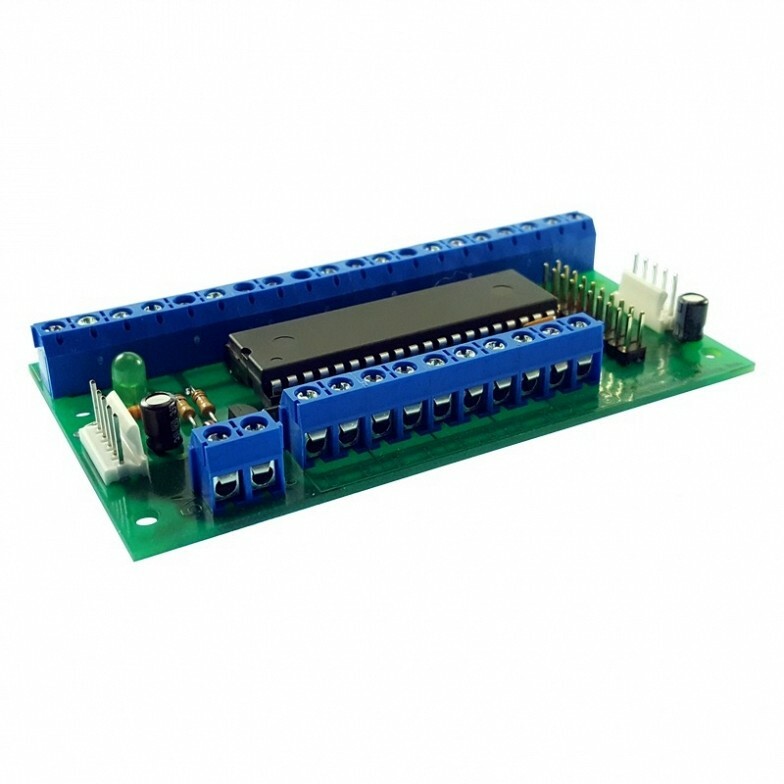 The Rotary-5 may be powered either directly from one of our keyboard encoder modules or from an external 5 Vdc supply. 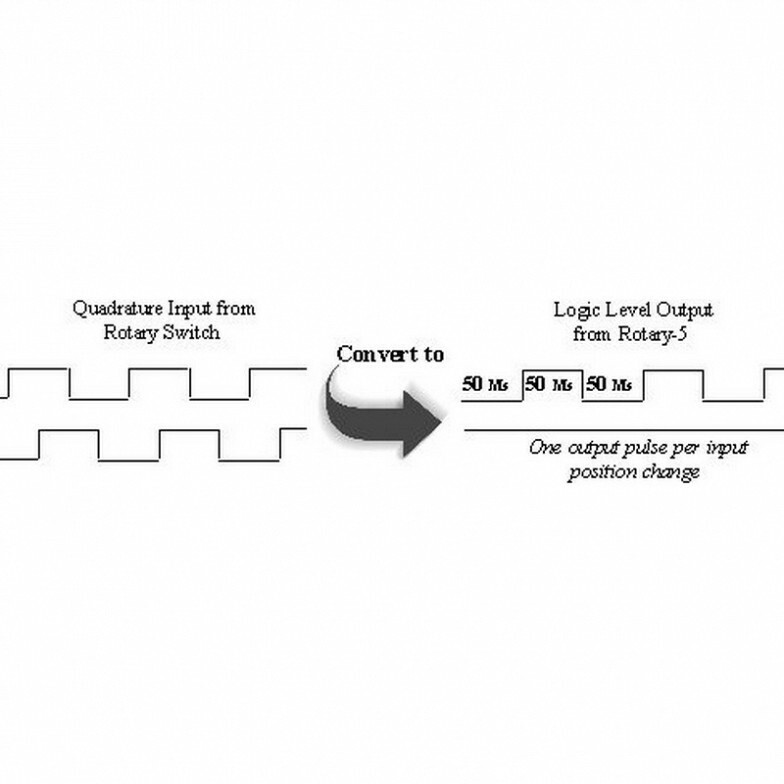 A five-channel rotary encoder interface for quadrature signal to pulse conversion! 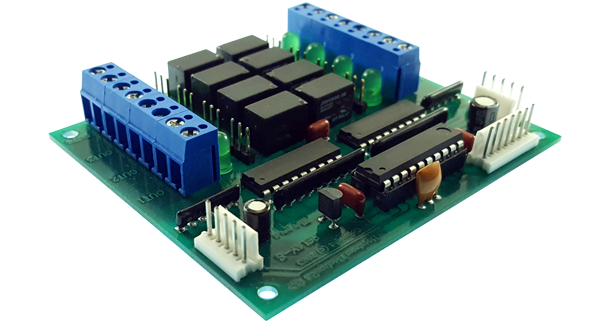 Our Rotary-5 Switch Interface Module converts rotary switch movement to output pulses suitable for driving keyboard encoder inputs. The quadrature signals from up to five rotary switches are translated into two outputs per switch, which activate independently based on the directional rotation of the switch. 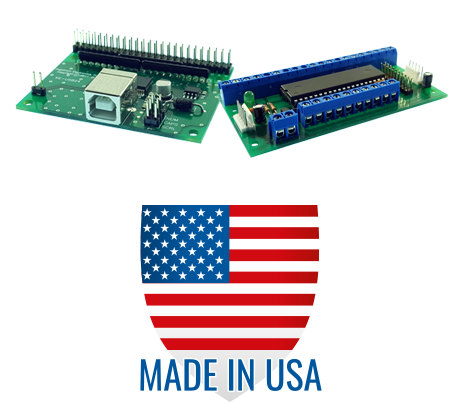 The Rotary-5 module converts the quadrature signals from mechanical and/or optical rotary encoder switches to logic level pulses. 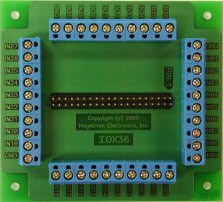 These output pulses are suitable for driving direct inputs on our keyboard encoders to produce a keystroke or keystrokes for each change of position of the rotary switch The Rotary-5 can be used with all Hagstrom Electronics, Inc. keyboard encoder modules or have the capability of operating as a stand-alone device. 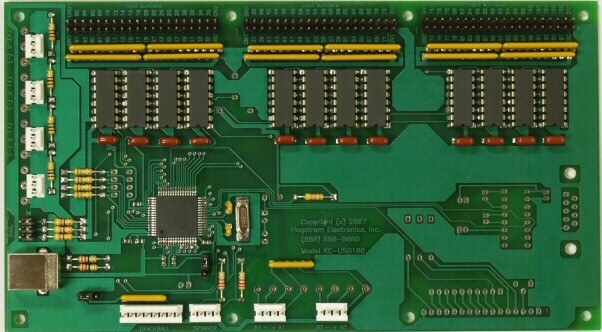 Each module allows for up to 5 rotary switches to be connected at one time. Multiple Rotary-5 units may be daisy chained together using our MTA100-5-36-FF cable harness to expand the number of rotary encoder switches. The Rotary-5 features two option settings for each of the five rotary switch locations. These additional jumper settings affect how each rotary input is handled and may be adjusted independently. The first jumper option setting allows the number of outgoing pulses (per each incoming pulse) of the rotary switch to be divided by either 2 or 4. The second jumper option setting controls the buffering of pulses for the rotary switch. The Rotary-5 requires a regulated voltage supply of 5 Vdc. 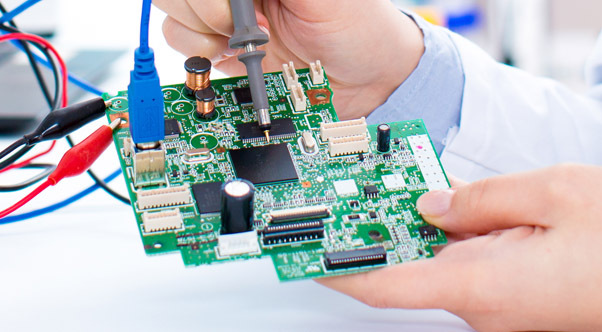 This voltage can be taken directly from one of our keyboard encoder modules or from an external supply. The printed user manual that is included with the unit illustrates the various keyboard encoder power locations. If a stand-alone power source is preferred, we also offer our KE-PWR5/2A regulated power supply (domestic orders only) to provide voltage for the unit. *MTA100-5-36-FF – 5 position Female to 5 position Female jacketed cable harness for daisy chaining Rotary-5 modules together. Length = 3 feet.